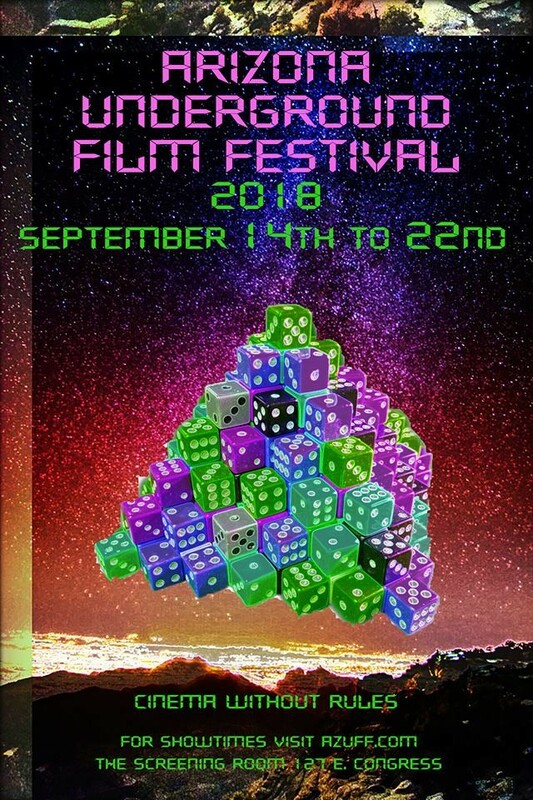 The Arizona Underground Film Fest Starts Tomorrow! Mad scientists, giant monsters and bearded action heroes are all scrambling out of the desert and into the theaters — The Arizona Underground Film Fest is here! This year’s fest is larger than the last, now stretching out to nine days of screenings from new indie films made right here in Arizona. Bullitt County. An action/thriller set in 1977 about four friends who reunite for a bachelor party to hunt for buried Prohibition money on Kentucky’s Bluegrass Bourbon Trail, only to become ripped apart by greed, corruption, and murder. 7 p.m.
After the Lethargy. The police confirms the presence of a “86-Code” in the National Park. A beast, coming from another world, could have woken up from its lethargy. 9 p.m.
Outside the Reel Shorts Block. Anywhere from five to 20 minutes in length, these short films span genres from comedy to horror to outright unclassifiable. 1 p.m.
Future Language. A distorted portrait of an artist that explores storytelling, ego, delusion, conviction, and memory. Von LMO is a musician/artist and self-proclaimed alien-hybrid who was a part of the late 1970s New York No Wave music scene. 3:30 p.m. The God Inside My Ear. After experiencing a peculiar and sudden breakup with her boyfriend, Elizia discovers a world of conspiracies, strange voices and horrifying visions. 5:30 p.m. The Rainbow Experiment. The story takes place in a high school where things spiral out of control when a terrible accident involving a science experiment injures a kid for life. 7:30 p.m.
Victor Goodview. One man must prove he is greater than the sum of his vices while fighting a losing battle against loneliness, destitution & a nasty bout of constipation. 10 p.m.
Secret Screening. A free event of a retro underground film! 1 p.m. Lesser Beasts. Four stories. One mystery. 3 p.m.
Kairos Dirt. A disparate group of mystical misfits intertwine with an otherworldly, genderless apparition through fantastic and carnal dreamscapes. 5 p.m. Call Me Brother. Lisa and Tony are sister and brother who grew up separately and are reunited for one weekend, growing closer than they ever had before. 7 p.m.
Reel After Hours. These are after hour shorts scheduled in the prime time. Why wait til later in the night to watch these? 18+ only. 7:30 p.m.
Hermetica Komhata HK320. A masterpiece of metaphysical science fiction made in 1943 by a mad scientist of dubious origin, who called himself Dr. Joseph H. Stanislaw. 7:30 p.m.
Ruminations. A documentary profile on Rumi Missabu, the iconoclast cofounder of San Francisco’s infamous Cockettes. Through archive footage, animation and new interviews with stars from SF’s queer art past, his lurid tales in and out of the spotlight are revealed as he reinvents himself at the end of his life. 7:30 p.m.
Clickbait. A college student who will do just about anything for Internet fame is kidnapped by a fan, and her reluctant roommate is the only one who can save her in this horror satire of popularity culture. 7:30 p.m. Hot Lead, Hard Fury. Shot entirely on Super 8 & 16mm film, this recent parody of exploitation films is a fun ride to days of cult classics from the 60s and 70s. 9:30 p.m. The Foaming Node. In Ian Haig’s endlessly fascinating ‘documentary’ The Foaming Node, the discovery and emergence of new bodily organs is essayed in meticulous detail. 6 p.m. Unbelievable!!!. A Different Kinda’ Trek with 42 previous iconic “Star Trek” actors in this film! Three astronauts along with their Leader Puppet Companion Captain Kirk Stillwood, travel to the Moon on a rescue mission to determine the fate of two Aeronautical Space Systems (A.S.S.) comrades who have not been heard from in several days. 7:30 p.m.
Boar. In the harsh, yet beautiful Australian outback lives a beast, an animal of staggering size, with a ruthless, driving need for blood and destruction. 9:30 p.m. The Drifting Reel Shorts Block. Reel Shorts Block. Anywhere from five to 20 minutes in length, these short films span genres from comedy to horror to outright unclassifiable. 1 p.m. The Sleeper by the River. A dark comedy based on the award-winning book “Les Bottes Rouges” (“The Red Boots”) by Franz Bartelt. 3 p.m.
Diminuendo. A director whose life crumbled when his Hollywood starlet girlfriend, killed herself, becomes obsessed with a robot designed to replicate her. Starring Richard Hatch (last starring role), and Chloe Dykstra. 5 p.m.
Savage Youth. Six young lives collide in the most horrific and twisted of ways. Based on true events. 7:30 p.m.
Amazon Hot Box. Described as perfect exploitation cinema! 9:30 p.m.
All screenings will be at The Screening Room, 127 E. Congress. $7.